Are the United States and China Condemned to a Military Stalemate? A new article posits a technology-heavy analysis of the future of the U.S.-China military balance. In a recent article in International Security, Stephen Biddle and Ivan Oelrich have developed a formidable analysis of how the balance of power and technology in the Asia-Pacific may shift over the next three decades. The argument, discussed earlier by Steven Stashwick, suggests that technology may push the United States and China into a rough stalemate in the middle part of the 21st century. Biddle, longtime scholarly analyst of military affairs and the author of numerous books and articles on land warfare (both its conventional and counterinsurgency variants), and Oelrich undertake an uncharacteristically technology-heavy analysis, concentrating on the physical limitations of extant and speculative strike and surveillance systems. The authors frame their analysis around a Chinese effort to coerce regional powers (most notably Taiwan) into submission through means of a bombing campaign, a blockade, or an invasion. As the authors project to 2040, the effort is necessarily deeply speculative. The authors assume conventional economic trajectories for China, the United States, and regional powers, and exclude the potential for disruptive, unpredictable technological innovations. This manifests in procurement assumptions that project the U.S. acquiring B-21 stealth bombers, long-range, carrier launched stealth drones, other long-range strike weapons, missile defense systems, and an array of electronic warfare assets. 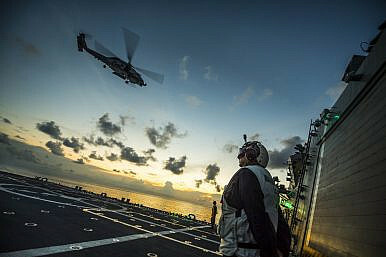 China works on perpendicular lines, emphasizing systems capable of finding and striking U.S. ships, planes, and fixed surface installations. Biddle and Oelrich concentrate heavily on the difficulty of locating and destroying strike, defense, and surveillance systems at the edge of an A2/AD bubble. The physical limitations of radar, combined with the vulnerability of space and aerial recon systems, make it difficult to project power very far from a landmass. In effect, Biddle and Oelgrin see East Asia developing into a constellation of competitive A2/AD bubbles, each centered in a landmass that can offer protection to an array of anti-ship and anti-air missiles. While planes and ships need to operate in relatively simple domains, land-based missile launchers can take advantage of the complexity of the terrain. These missiles, less vulnerable than those carried by ships, submarines, and aircraft, restrict the mobility of military forces across air and sea. This makes amphibious invasions exceedingly difficult, and tends to restrict bombing campaigns to long-range missiles (non-stealth aircraft, and possibly even their stealthy cousins, suffer heavily against integrated air-defense networks). However, anti-access systems conduct blockades exceedingly well, especially when the target falls within range of land-based sensors. This makes Taiwan, in particular, deeply vulnerable to Chinese coercion. Given that the maritime lifelines of South Korea and Japan also pass near China, this places them at some risk, as well. Biddle and Oelrich’s article makes a major contribution to the flourishing debate on the future of the U.S.-China military balance. Nevertheless, there are some questions worth asking about their analysis; these will be the subject of my next column. After US Missile Defense Salvo Test Against ICBM, China Warns of Proceeding ‘Carefully’Bolton: China Is One Reason US ‘Looking at Strengthening National Missile Defense’How Would a War Between the US and China End?US Starts Deploying THAAD Anti-Missile Defense System in South KoreaHow Flexible Are US Counter-A2/AD Systems Anyway?